467 Beacon is located on the south side of Beacon, between Hereford and Massachusetts Avenue, with 465 Beacon to the east and 469 Beacon to the west. 467 Beacon was designed by architect John H. Besarick and built in 1888-1889 by building contractor Asa Harden Caton for speculative sale, one of two contiguous houses (467-469 Beacon). Asa Caton is shown as the owner of 469 Beacon on the original building permit application, dated October 6, 1888 (the permit application for 467 Beacon has not been located), and on the final building inspection report for 467 Beacon, dated September 11, 1889, and for 469 Beacon, dated October 29, 1889. 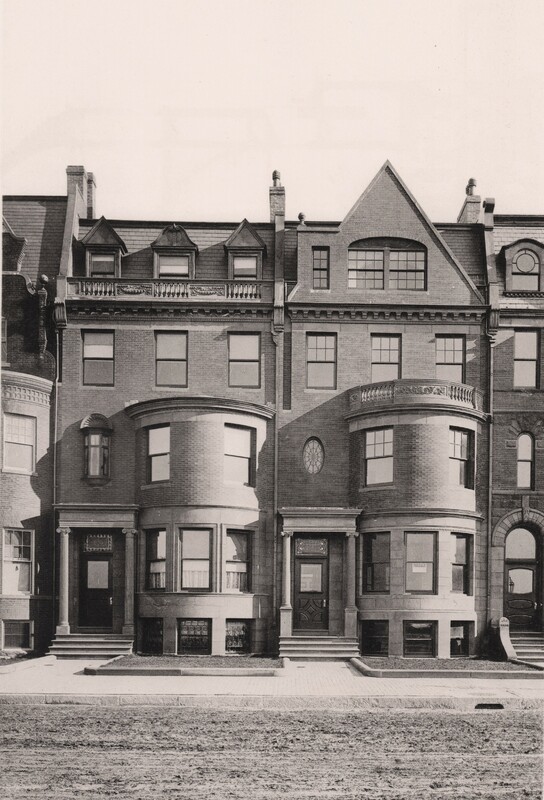 Asa Caton purchased the land for 465-467 Beacon on May 18, 1888, from Frances Anne (Codman) Sturgis, the widow of architect John Hubbard Sturgis. The lot was part of a 375 foot parcel John H. Sturgis purchased on January 24, 1880, from a real estate investment trust formed by Grenville T. W. Braman, Henry D. Hyde, and Frank W. Andrews. The trust had purchased the land from the Boston Water Power Company on March 1, 1872. The 375 foot parcel was one of three John H. Sturgis had purchased in January and February of 1880 comprising all of the land on the south side of Beacon from a line 198 feet west of Hereford to Massachusetts Avenue, with a frontage of 442 feet. Click here for an index to the deeds for 467 Beacon, and click here for further information on the land on the south side of Beacon between Hereford and Massachusetts Avenue. On June 22, 1889, 467 Beacon was purchased from Asa Caton by Rebecca A. (Crosby) Stevens, the wife of retired life insurance agent Samuel S. Stevens. They previously lived in Brooklyn, New York. They also maintained a home in West Islip on Long Island. On July 19, 1892, Rebecca Stevens transferred 467 Beacon to their two children, Horace H. Stevens and Helen (Nellie) L. (Stevens) Thomas, the widow of Henry W. Thomas. They both lived in West Islip. By the 1896-1897 winter season, Samuel and Rebecca Stevens had been joined at 467 Beacon by their daughter, Helen Thomas, and her four children: Rebecca S. Thomas, Lucie W. Thomas, Ruth Crosby Thomas, and Henry W. Thomas. Rebecca Stevens died in December of 1897. 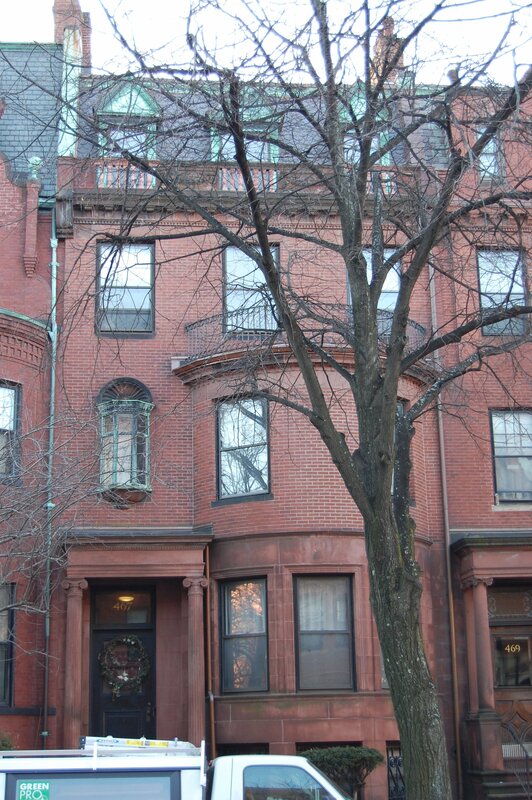 Samuel Stevens, Helen Thomas, and her children continued to live at 467 Beacon. Rebecca Thomas married in November of 1902 to Edward H. Kendall, Ruth Thomas married in September of 1906 to John Winthrop Foster, and Lucie Thomas married in November of 1906 to Frederick T. Bedford. Samuel Stevens died in December of 1907 and Helen Thomas and her unmarried son, Henry, moved soon thereafter. They were living in West Islip, New York, in 1910. 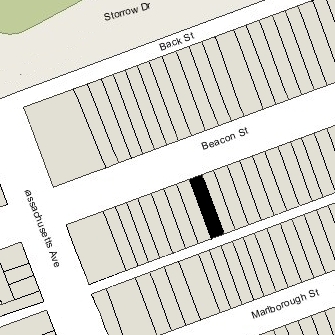 467 Beacon was not listed in the 1909 and 1910 Blue Books, nor was it enumerated in the 1910 US Census. On March 21, 1910, 467 Beacon was purchased from Horace Stevens and Helen Thomas by Helen Lucy (Stebbins) Kennard, the wife of Arthur Wood Kennard, a jeweler. They previously had lived at 447 Beacon. They also maintained a home in Cazenovia, New York. The Kennards raised their four children at 467 Beacon: Charles Fairchild Kennard, Katharine Marjorie Kennard, John Stebbins Kennard, and Helen Grace Kennard. By 1911, the Kennards had been joined at 467 Beacon by Arthur Kennard’s nephew, Spencer Parry Kennard, the son of William Parry Kennard and Delfina (Castro) Kennard. He worked as a clerk with Arthur Kennard’s jewelry firm. In the spring of 1913, Helen Kennard and their four children traveled to Europe, where they spent the 1913-1914 winter season in Paris. 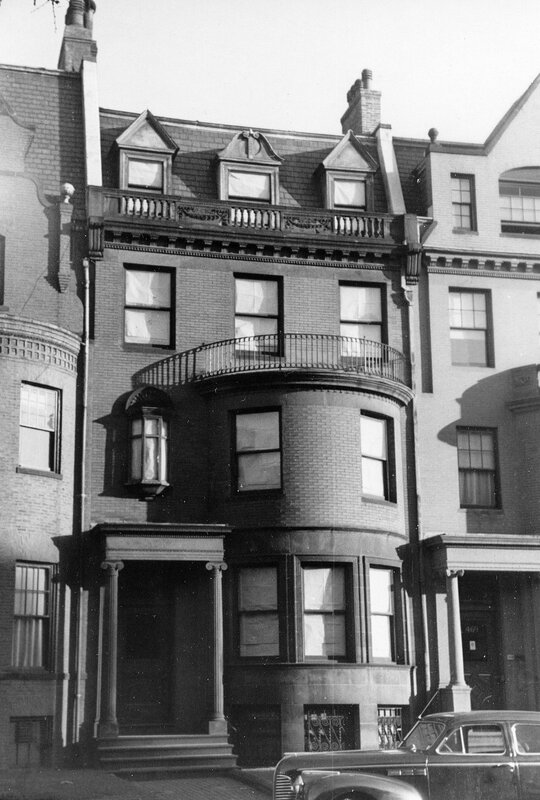 While they were abroad, Arthur Kennard appears to have remained in Boston but he and his nephew lived elsewhere and, during the 1913-1914 winter season, 467 Beacon was the home of Christine (Rice) Hoar, the widow of Rockwood Hoar, and their two daughters, Frances Helen Hoar and Louisa R. Hoar. Their usual residences were in Worcester and Washington DC. Rockwood Hoar had been a lawyer and US Congressman, and was the son of US Senator George F. Hoar. In November of 1915, Christine Hoar married again, in Washington DC, to Congressman Frederick H. Gillett of Springfield. Helen Kennard and their children returned from Europe in mid-1914, spent the summer at Cazenovia, and the family resumed living at 467 Beacon in the fall of 1914. Spencer Kennard continued to live with them. In October of 1914, Spencer Kennard married to Madeleine Marie White. After their marriage, they lived at 31 Newbury and then in Lowell. Helen (Stebbins) Kennard died that same month. Arthur Kennard and their children continued to live at 467 Beacon and in Cazenovia. Katharine Marjorie Kennard married in June of 1922 to Francis Whiting Hatch. After their marriage, they lived in Cambridge. He was an advertising executive, author, and composer. Their son, Frederick Whiting Hatch, Jr., was an unsuccessful candidate for governor of Massachusetts in 1978. Arthur Kennard moved from 467 Beacon by 1923 and by the 1923-1924 winter season was living at 82 Chestnut. By the 1922-1923 winter season, 467 Beacon was the home of George Swinnerton Parker and his wife, Grace Eliza (Mann) Parker. They previously had lived in Brookline. George Parker was an inventor and manufacturer of games, the founder of George S. Parker & Co. (in 1883) which had become Parker Brothers in 1888. They continued to live at 467 Beacon during the 1923-1924 season, but moved thereafter to 46 Mt. Vernon. On September 15, 1924, 467 Beacon was acquired from Helen Kennard’s estate by Mrs. Lillian Sprague (Darrow) Beal, the wife of William Fields Beal, and their sons, Willis Payne Beal and James Holland Beal. They previously had lived in 144 Mt. Vernon. They also maintained a home in Nahant. She was separated from her husband, who was a real estate broker in New York City. Willis P. Beal, a bank trust officer and later an investment broker, married in July of 1933 to Cecily D. Livermore. After their marriage, they lived at 101 Chestnut. James H. Beal, an Episcopal clergyman, married in November of 1934 to Georgette Appleton Binney. After their marriage, they lived in Newburyport, where he was assistant rector of Christ Church. Lillian Beal continued to live at 467 Beacon until her death in December of 1942. The property was not listed in the 1942-1944 Lists of Residents and is shown as vacant in the 1942-1946 City Directories. On February 21, 1944, 467 Beacon was acquired from Lillian Beal’s estate by Israel Ramler. He was president of the State Electric and Lock Shop, and lived in Roxbury. He converted the property into a multiple dwelling, either apartments or a lodging house. Israel Ramler died in July of 1948. It continued to be owned by his estate until the mid-1950s. On July 13, 1956, 467 Beacon was acquired from Israel Ramler’s sister. Clara (Ramler) Levine, the wife of Isadore Levine, by the S. S. Ganick Corporation. On September 17, 1975, 467 Beacon was purchased from the S. S. Gannick Corporation by real estate dealer George P. Demeter, as trustee of the Demeter Realty Trust. On February 1, 1996, he transferred the property to Kings Limited Partnership, managed by Kings, Inc., of which he was the president. 467 Beacon remained an apartment house, assessed as a four- to six-family dwelling, in 2017.